This post has been a long time in the making. Mainly because it took me forEVER to get all these pics & videos off my phone & organized 🙂 …However, I really wanted to share the journey we had a few months back of Liam learning to swim. It really was quite the experience — fun, tiring (for ALL of us), hard work for him, for sure, & at times, emotional for this mama. We started lessons on Monday, April 7th & he finished the program on Thursday, June 4th. In our area of town, there’s a few companies that we could have selected. Obviously, some might say, why not just teach him yourself & save a few bucks…..Well, good point, I guess, but we just didn’t feel comfortable doing that. Florida is surrounded by bodies of water. We wanted him to be taught life saving skills in the water. In a split second the unthinkable could happen. We wanted him to be prepared for that, and bottom line — We don’t feel that you can put a price on your child’s life. Teaching him these skills was just too important to us, so we made it happen. What Liam was taught over the 9 week period that he went for lessons (our schedule was extended because of weather delay’s & sickness) was basic water safety & survival. I feel like I could write you a book about all that Ms. Heidi & Ms. Katie taught us, but I’m not the expert in all that jazz, so if you’re interested in it for your little one, please go to their website or link to their private Facebook group from their site. If you’re not in our area, you can find more info by searching Infant Self-Rescue. It was a running joke that Liam would smile & say “yes” to anything that Ms. Katie or Ms. Heidi asked of him. Hilarious! Besides the first day or two, this kid never cried. He loved it! The puddle jumper vest just allowed him to kinda float along in the water and not use his legs, so it was hard to get him to start kicking at first and get moving. Here’s some early video of that process…. Liam really loves his SwimSprout shirt from Ms. Heidi & wears it frequently to school. Here he is one day before school during mid-point of our lessons. Week #7 – cheesing it up! 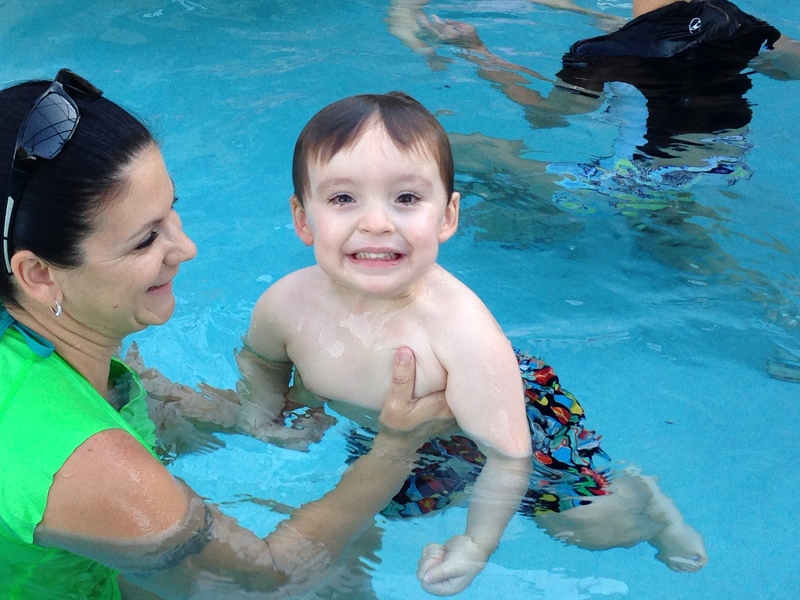 Toward the end of his lessons, he got to be quite the strong swimmer and got awesome at holding his breath. Almost, too good! Ms. Katie had to keep putting him further and further away from the steps because he kept reaching them so fast AND not rolling over onto his back to take a breath….what a stinker! 6/4/14 — quick selfie to show how excited we were on swim test day — NOT so excited once he actually got into the pool, but he did AWESOME! the FABULOUS SwimSprout teachers who made all this possible — Ms. Katie & Ms. Heidi. WE LOVE YOU!!! What a great experience this has been for our entire family!! We can’t wait to catch up with Ms. Heidi & Ms. Katie in the fall for a refresher session. Previous postThrowback Thursday: Murphy Birthday Memories! Next postHappy 3rd Birthday Liam! What a fantastic experience!!!! Heather, I think you should become a director….you certainly have a star in training…..Thank you for the keeping us all up to date with the tadpole. Does an old lady’s heart good!!! This was awesome to watch while I am laying in bed recovering. Liam is such an amazing child and I love this blog! What a great way to feel like we are always involved in his daily life!! Thank you Heather for being such a wonderful parent AND writer….Love you very much!